Two days ago, Microsoft announced the Surface, their new in-house tablet. Running Windows 8 or Windows RT (depending on the architecture), it appears to be a standard tablet with an interesting unique feature. The screen cover is in fact a keyboard, supposedly capable of detecting the difference between typing and when an arm or hand is laying across it. Microsoft posted the announcement trailer on YouTube for all to see. Right off the bat, I noticed two problems. 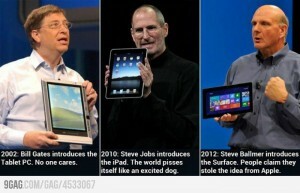 The first is that according to reports, the Surface will not be sold everywhere. It can only be purchased online and through the Microsoft Store’s retail locations, as opposed to the iPad’s wide availability. The second is that Surface is a quickly recycled name. Until recently “Surface” was the name given to what is now called PixelSense, which is a technology used for touchscreen displays in large environments such as furniture. Harrah’s and Microsoft, for example, made a big deal over the fact that Microsoft Surface/PixelSense displays were installed in the iBar at the Rio in Las Vegas. Of course, cries from some started coming out that Microsoft was ripping off Apple once again. This prompted an image meme I saw on a friend’s Facebook page yesterday. To be perfectly honest, there’s some truth in both sides of the argument. I don’t think anyone can seriously argue that Microsoft isn’t the first to market in some areas of technology, like tablets and phones. The “rip off” (if one wishes to use such a loaded and inaccurate term) is quite a bit more subtle than that. What happens is that Microsoft is the first to market, but its implementation of the technology is clunky at best. Eventually, Apple brings its own version to market, which becomes very popular due to their attention to quality and usability. Microsoft then looks at what Apple did, and re-engineers its products to fix the problems that Apple’s implementation corrected. For example, let’s look at cell phones. I’ve personally used three different cell phones that used Microsoft’s Windows Mobile operating system: the Cingular 8125, the Cingular 3125, and the AT&T Tilt. While I enjoyed using the phones because the available software was more varied than the Blackberry devices of the time, the interfaces themselves tended to be awkward, and stability was never a sure thing. Once the iPhone 3G came out (the first version with Exchange ActiveSync support), I switched over and marveled at how intuitive it was to use. After that, Windows Mobile devices seemed even more painful to use. Since then, Microsoft has abandoned Windows Mobile and released Windows Phone 7, which is a far more efficient phone operating system using the Metro UI planned for Windows 8. Tablets are another example. I’ve seen tablets as far back as 2004, when we purchased a tablet PC for the COO of the company I was working for at the time. To say that the tablet was terrible is, in my opinion, an understatement. While the unit had a touchscreen, a special stylus was needed in order to be able to write on it. Also, the operating system on the tablet was Windows XP Professional. While Windows XP is a great desktop OS, it’s absolutely miserable to use on a touchscreen. I’m not sure how the COO tolerated using that machine outside of a docking station. Of course, once the iPad came out, Microsoft’s tablet ambitions started gearing towards Windows 8/RT with their Metro interface. Of course, there’s no guarantee that Microsoft’s Surface tablet will be a success like the Xbox 360 or a failure like the Zune. I personally admit to some trepidation, if only because of Microsoft’s OS strategy. Unlike Apple, who has one OS line for its desktop/laptop machines (Mac OS X) and another for its phones and tablets (iOS), Microsoft is using Windows Phone for phones only, while Windows 8 will be used on tablets and desktops/laptops. I’m not sure how well that will work out for them; while Metro works great for a touchscreen interface, I’ve tried it in a desktop environment (VMware virtual machine running Windows 8 Consumer Preview) and it was absolutely terrible. Worse, Metro is the default UI and disabling it is not possible. With a keyboard and mouse, Metro is unintuitive and frustrating to figure out. Of course, only time will tell whether Microsoft’s strategy will work out for them. Unfortunately, while they look to Apple to fix where they went wrong beforehand, I fear they didn’t learn the proper lessons or implement the proper corrections. It’s no secret that Jennifer and I watch The Daily Show with Jon Stewart on a regular basis. He may be a comedian, but he tends to have some of the most insightful commentary on current news items. That said, we found his piece on Florida’s governor Rick Scott yesterday to be both hilarious and insightful. I’ll post the embed here so you can get caught up on the gist of what was said. Of course, my first reaction was to think of what Jon Stewart said in the above clip. My friend Joseph also made the observation that it doesn’t help anyone, simply because there are not any alternatives for people who fail the drug testing other than losing public assistance, at which point they turn to crime to get their fix. However, the problem with the system is a lot more fundamental. 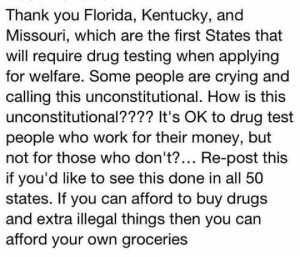 As reported in the news recently, only 2-3% of welfare applicants in Florida failed drug screenings, and less than half of those canceled their drug screening. Worse, as the state was required to reimburse applicants for the cost of the screening, the state actually ended up spending $46,000 more than it would have if it had simply given the people who failed the drug screening the welfare money in the first place. In other words, the state ended up spending more money on a program that did not have a significant effect. In fact, the only winner in this situation is Rick Scott, who can claim to be tough on “welfare fraud”, even though this program has been proven ineffective. Supporters of the bill claim that it was never about saving money, but was to keep welfare from being used for drugs. Even if that is the case, isn’t a tenet of Tea Party dogma (Scott ran under a Tea Party platform) an abhorrence for wasteful government spending? Would this not be a perfect example of wasteful spending, if it’s doing nothing yet costs thousands of dollars? Interestingly enough, Scott cofounded a company called Solantic, who does drug testing among other services it provides. While there is no link that I’ve found linking Solantic to the welfare drug testing, it is linked to drug testing state employees. According to reports, Rick Scott is legally in the clear because he moved his financial stake in the company to a trust his wife oversees, but I would argue that it does not ethically put him in the clear. That is mostly a point for another discussion, but it does strike me as more than a little coincidental that Scott is gung-ho for this policy when he has a financial stake in a drug testing firm. 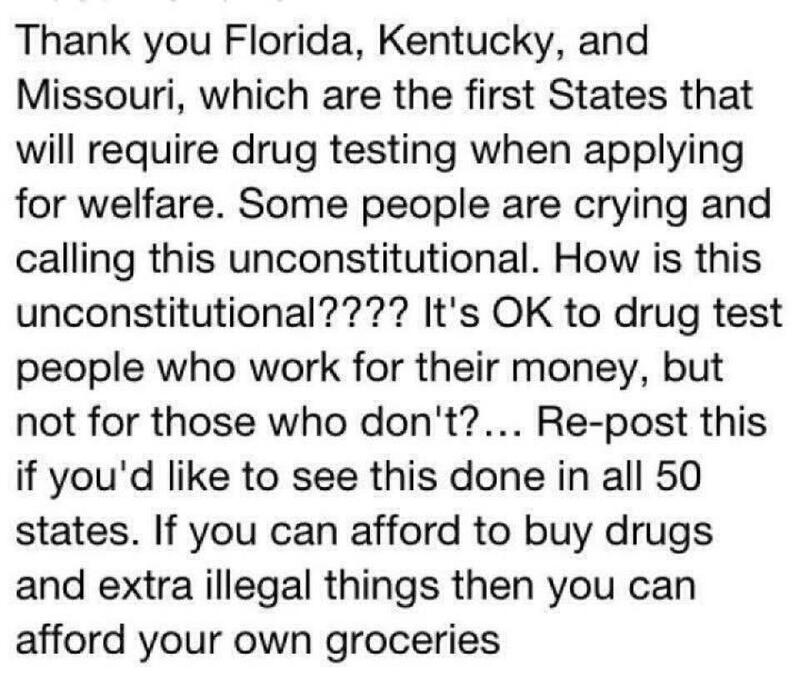 In any event, the fact is that this policy ended up being a colossal failure when implemented in Florida. Moreover, a Federal court has granted a temporary injunction against the law while waiting for it to go to trial. The judge in that case even made the point that she would likely find it unconstitutional. My advice to those thinking of posting this meme to your Facebook walls is this: take a look at its effectiveness so far, take a look at our courts are looking at it, and ask yourself if it’s really worth the time and effort on something that appears to be an ineffective waste. A music meme. Blame Jenn Dolari. I know I should be doing an actual post at some point. I’ll do one. I promise. In the meantime, here’s a musical meme I yanked from my friend Jenn Dolari. Step 1: Put your iTunes or equivalent on random. Step 2: Post the first or so lines from the first 20 songs that play, no matter how embarrassing. Step 3: Get your friends to contemplate your bizarre tastes in music by guessing the songs. Step 4: Bold out the songs when someone guesses correctly. 1) Hey man, please don’t make a sound. Take a look around, can’t you see what’s right in front of you? Have a little taste, no more time to waste. You don’t wanna get left behind cause it’s all coming down right now. 2) In the time when darkness ruled, no one saw the light. In the cold black emptiness, victims of the night. 3) On his way to dinner, when it took him by surprise, and with one pull of the trigger, he would vanish overnight. Dancing by the roadside, holding on for dear life; then a gun from out of nowhere made a widow of his wife. 4) The wind was a torrent of darkness among the gusty trees. The moon was a ghostly galleon tossed upon the cloudy seas. The road was a ribbon of moonlight over the purple moor. 5) You can have my autograph. I think I’ll sign it love to you. But should I sign it just for you? 6) Only came outside to watch the nightfall with the rain. I heard you making patterns rhyme. Like some new romantic looking for the TV sound, you’ll see I’m right some other time. 7) Show me a river that’s so deep, show me a mountain so high. I’ll show you love that’ll last forever. Flyin’ high, so high. 8) You get to feel so guilty, got so much for so little, then you find that feeling just won’t go away. You’re holding on to every little thing so tightly ’til there’s nothing left for you anyway. 9) Uhh! Awww, sookie sookie now! Hey! Oww, uhh! Come on, baby! Hey there, Sugar Darlin’, let me tell you something girl, I’ve been trying to say, now. 10) Love – Devotion – Feeling – Emotion. Don’t be afraid to be weak. Don’t be too proud to be strong. 11) Wake up in the morning, and I raise my weary head. I got an old coat for a pillow and the earth was last night’s bed. 12) Highway run into the midnight sun… wheels go round and around. You’re on my mind. 13) I tried to kill the pain but only brought more… so much more. I lay dying and I’m pouring crimson regret and betrayal. 15) Every night she walks right in my dreams since I met her from the start. I’m so proud I am the only one who is special in her heart. 17) As I wake up in a room somewhere, dawn light not yet showing, there’s just a thin horizon between me and her; the edge of a half-dream glowing. 18) Words like violence break the silence… come crashing into my little world. 19) Tell me, Doctor, where are we going this time? Is this the 50’s or 1999? 20) I know you broke up with him, and your heart’s still on the shelf. It’s been over two years for me and I’m still not quite myself. Time Out’s list of essential science fiction films. Italicise the ones you’ve seen, and bold those you like, while strike-through the ones you disliked (nb: I’ve changed the formatting codes to make this clearer). 1. Put your iTunes (or any other media player you may have) on shuffle. (1): Answer the following questions in a comment. (2): Make it fun… feel free to read other peoples comments and reply. Make friends, add each other, mingle… and remember… have fun! (3): Start a “Friendzy” in your own journal… and send people over here if the mood so strikes you. For B5 fans – when you see this, post a B5 quote in your own journal. Delenn: This is Ambassador Delenn of the Minbari. Babylon 5 is under our protection. Withdraw or be destroyed. Captain Drake: Negative. We have authority here. Do not force us to engage your ship. Delenn: Why not? Only one human captain has survived battle with a Minbari fleet. He is behind me. You are in front of me. If you value your lives, be somewhere else. Don’t change your clothes, don’t fix your hair – just take a picture.